As many of you know, spiders are not insects. They have different characteristics that place them in the arachnid group. Other members of the arachnid family include ticks, daddy long leg spiders, scorpions, mites, and harvestment. Spiders are either terrestrial which means they live only on the ground, while others are arboreal which means they live in trees. Throughout this project I will describe to you the difference between spiders and insects, as well as inform you on the importance of spiders to the ecosystem. 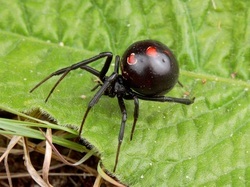 Here is a picture of a Black Widow Spider. These spiders are very dangerous and are identified by their hour glass shaped mark on their abdomen. They can be found in temperate regions throughout the world. The main reason Black Widow spiders are so dangerous is because of the venom they produce. The bite of these spiders are so feared because their venom is reportedly 15 times more powerful than the venom produced by a rattlesnake! This is a Brown Widow Spider. This spider was established in Southern California in the early 2000's. 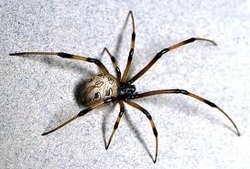 The brown widow spiders is projected to expand their range to Central California in the near future. The brown widow is known for their tremendous production of eggs throughout their lifetime. They lay about 120-150 eggs per sack and up to 20 egg sacs in their lifetime! These spiders prefer to be in a tropical site. This is a Wolf Spider. These spiders belong to the genus Lycosa, which means which means "wolf" in ancient Greek. Wolf spiders are unique because unlike most spiders, they catch all their prey in their webs. They are able to do this due to their strong bodies and very sharp eye sight. They have eight eyes! 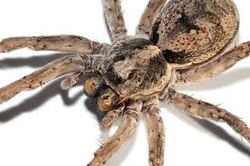 Wolf spiders are able to live nearly anywhere throughout the world. They favorite types of areas though are grasslands and meadows even though they can adapt to a wide variety of locations. 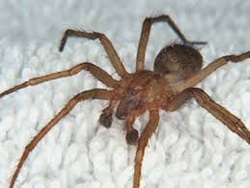 This is a Hobo Spider. These spiders are mostly encountered from June to September because the males are searching for females. Some characteristics of these spiders are: long legged, swift-runners, and they building funnel or tube shaped webs. They are found on ground level areas because they are terrible climbers. Hobo spiders were introduced to the Pacific Northwest from Europe. Some people refer to them as the "aggressive house spider".